This entry was posted in Like Show Business and tagged Gardner Dozois by Mike Glyer. Bookmark the permalink. Oooh, I like this TOC. All the stories on it I’ve read are good, and most were favorites. Particularly pleased to see R.S. Benedict’s “My English Name,” which is also in Horton’s collection. Benedict looks like an author to watch! Standback: Particularly pleased to see R.S. Benedict’s “My English Name,” which is also in Horton’s collection. He may mean that story is also in Strahan’s annual (ToC recently posted here). I read “Zigeuner” in Asimov’s and the ending took me by surprise, but frankly on reflection I don’t believe it. Not a possible alternate. If anyone’s interested, I keep a record of this series and can extract some statistics. For example, Robert Reed and Nancy Kress are tied for first place as the authors featured most often, with 26 appearances each. Whoops! Good catch, and Mike has the right of it 🙂 Strahan’s anthology, not Horton’s. It’s also “Ballyvoloon” and “Prime Meridian” and “Thirty-Nine Skink,” at least. I’ve updated my collated link list (now with actual collation!) and added the place of publication and so on. I thought when I read the list that he’s maintaining a fairly limited taste. How do you suppose he finds the material? Lela E. Buis: I thought when I read the list that he’s maintaining a fairly limited taste. How do you suppose he finds the material? He tells you how he finds his material in the prefaces to his Best Of collections. Dozois is (and has been for decades) a voracious reader of short fiction in print magazines, online fiction venues, and anthologies and collections. Each year in his introduction to the anthology (last year’s can be previewed here), he lists the numerous venues from which he’s read; for last year’s edition, I count at least 29 print and online venues, plus at least 24 anthologies. In other words, he probably reads at least a thousand pieces of short fiction each year. This year’s Best Of contains selections from 17 different venues. So, while someone evaluating the stories which he selects may voice the subjective opinion that his taste is “fairly limited”, there is no question that his reading is most certainly wide and varied. @JJ: Thanks for the info. I expect at least a few regular repeats; there are some prolific and very good short fiction writers in the field, e.g., it doesn’t surprise me that Kress is regularly in “best of” anthologies. 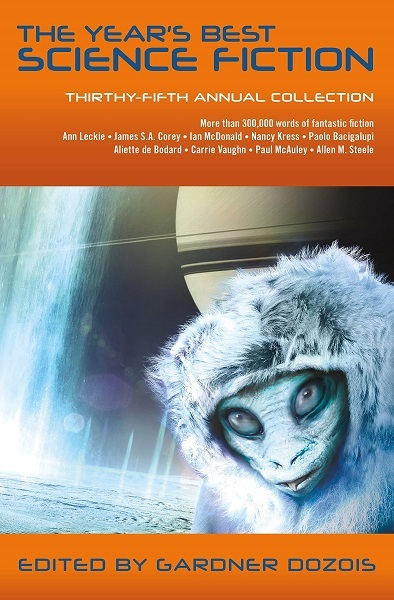 Kendall: I expect at least a few regular repeats; there are some prolific and very good short fiction writers in the field, e.g., it doesn’t surprise me that Kress is regularly in “best of” anthologies. This is the 35th year of this anthology, after all (it started in 1984). Kress and Reed both started being published at about the same time as this anthology series, and since then she’s published more than 200 pieces of short fiction, he’s published more than 300, and both of them have more than 130 appearances on award shortlists and longlists. In light of that, 26 appearances in this anthology series hardly seems excessive.